It has been a while since I have sat down and written a blog. The last few months have been super busy with working everyday, writing stories for my Paranormal Creative Writing class, and making plans to go back to school. 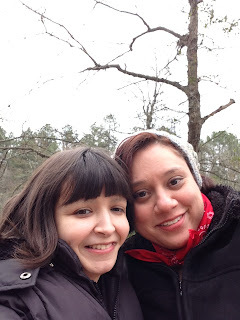 I thought I would share some of my adventures that I had at the beginning of March when I had an amazing time going to visit a friend in San Francisco and then making our way to North Carolina for PRS Camp Paranormal. My adventures started on February 27th. Chad was able to take some time off work to drive me to the airport. I was so excited to be spending the evening with my friend Ginnie at her home in San Francisco and then traveling together the next day to North Carolina. The flights went well, the layover in Seattle was 3 hours long but as usual I got through it, thanks to my phone keeping me occupied, and listening to music. Once I got into Oakland, I got into a taxi. At first the Taxi driver had no idea where I was going, and of course I wasn't much help since I had never been to the area where Ginnie lives, so I just assumed he would know since he was the driver. We took a few wrong turns, and then he finally pulled over. You know when you watch too much CSI, when you think...why is he pulling over and stopping the car. I panicked for a few minutes but then he re-entered the address and then he soon realized that he had put in a wrong city. LOL! We had a good laugh about it, and then soon we were on our way. The initial drive should've only taken 15 minutes instead of almost an hour. But in the end it worked out, and soon I saw Ginnie standing by the side of the road ready to greet me. I got out of the car, and we gave each other a hug and then we went into her home where I was able get more organized and put my suitcase in her room. Then we decided we would go for a walk and find somewhere to eat. It was such a nice day in Alameda and I couldn't believe how warm it was, considering at home I had left the rain and cold. We talked about everything and anything we could think about. It was so good to catch up, even though we talk to each other everyday. Soon we found what appeared to be a small Pizza Cafe, we went in and ordered a pepperoni pizza, but instead the server gave us something completely different. LOL! Neither one of us cared since we were so hungry and it tasted good. After eating, we headed back to Ginnie's house, watched TV and went to bed. Although neither one of us got much sleep since we were up until 4am laughing about random stuff. The next morning Ginnie's mom told me that we had kept her up all night, but she didn't care because it was good to hear us laughing and we were obviously having fun. I quickly apologized and thanked her for having me. We met up with Deeanna at the airport, checked our bags and then headed to the gate. I was so excited to be flying Southwest since it meant we could pick our seats, have as many snacks as we want and the flight attendants are always so friendly. The first flight was 4 hours to Chicago and our second flight was about an hour and a half to Raleigh. We literally went from one plane to the next as they were already boarding. 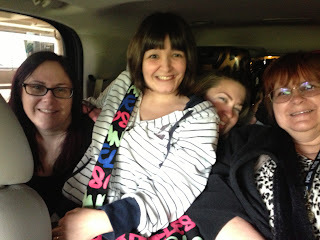 When we got to Raleigh we took a short shuttle over to the hotel and went to bed. It was a long day, we were all exhausted but very excited for camp the next day. The next morning a friend picked us up and we went to meet our other fellow campers at the airport. The road trip was another awesome adventure. Since there weren't enough seats due to all of our luggage we had to make things work. Let's just say, for those of us who were there and experienced it, it will always be an adventure that I will never forget and that it was a lot of fun. Plenty of inside jokes were made and shared while at camp...LOL! We all cheered once we made it to Rockfish Camp. The location was beautiful, lots of space and being able to look over the lake was just amazing. We went into the main lodge and registered and quickly reunited with old friends and met new friends. We were greeted by Chris and Sergey who gave us hugs, and our packages of which house we will be in for however long we were staying for. Once we knew which Cabin we were going to be in, we all took our suitcases and seperated. I was in the GSD group, and Chris Edwards was my leader for the week. I loved the lay out of the cabins as it was all one room, with many bunk beds to choose from. Some of my cabin mates were already there, and had set up so we quickly introduced ourselves. Later on in the day we played ice breaker games and then we all met at the Dining hall for our first meal together. I loved how the meals were family style. The food and drinks would be placed in the middle of the table and we would all pass it around and share. 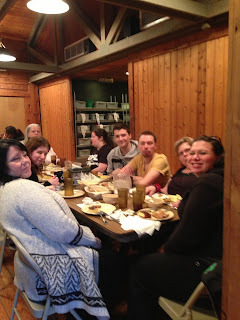 The staff did an amazing job making sure there was enough to go around, and if we needed more they were happy to serve us. In the evenings we would all separate into our groups that we had been assigned to and our group leaders would meet us in our cabins. On the first night, Chris had us interview each other, and would ask us questions about the person we are interviewing. If we didn't know something, he would ask us questions about what our thoughts were to dig deeper to find out more. 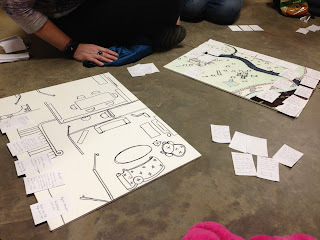 The second night we shared our own personal paranormal stories, and the third night we played a board game that Chris and Eilfie had worked so hard on creating. It was mainly for us to find out what it's like to work in the field and how much it costs to do certain things like holding events, raising Buell bucks for investigations and equipment that you may need for a clients home or business. Playing the board game is when I felt like all of our cabin mates really bonded. We had to interview each other, come up with stories to solve cases, work with the equipment that we had, plan our events, and come up with ways to save Buell bucks. It was so much fun, we all communicated really well, lots of laughs, jokes and so tired because we had played for 4 hours and still didn't get to the second part of the game. LOL! I definitely learned a lot by being in the GSD group, not just about working in the paranormal field, but also finding out in which areas I would work best in by truly discovering my personality and interests. Chris definitely challenged me in all areas that he could and that is something that I really enjoy because it does push me out of my comfort zone, and also helps me realize that I can do it. I also think I learned more about building self-confidence. It was cool to have Chris there to talk to as well. He took the time to get to know everyone, and listen to what everyone had to say. I was actually surprised that he knew me better than I thought he did. I really admired that. I have met Chris on several PRS events, but having him as my GSD leader I definitely felt like I got to know him well. When we were all together as a group we also had bonfires, played games, watched X-Files, watched movies, investigated in the woods, dining hall, and cabins. Those who didn't want to investigate could still participate by listening to audio that we recorded during the investigations. I have investigated before, but by the end of the week I felt more confident and comfortable. We all did a lot of investigating some of us got interesting pictures, audios and had experiences while some of us didn't and despite the cold we all had a good time, and it was just another way to bond with each other. Every morning before lunch we would have meditation with Sergey. We learned how to meditate, what some of the ways we can meditate and what method works for everyone. It was a great way to start a busy day, and to calm our minds. I always looked forward to it, not only mentally but also for learning purposes. During the day there were a lot of activities that you could take part in. The camp offers archery, canoeing, ziplining, BB guns, rock climbing, etc. I enjoyed my time going for walks everyday. There were a lot of trails to choose from. On my walks I came upon tree houses, porta-potty, and the yurts. When I wasn't walking I enjoyed sitting down by the lake, listening to music and enjoying the scenery around me. I can't wait to go back in June and hopefully have the chance to go swimming. We also had several lectures throughout the day. I would have to say my favorite lectures were Good vs. Evil by Adam Sedlock, Analyzing EVP, Photos and video evidence and Modern Tech of Paranormal Investigation by Sergey Poberezhny, Historical Research, and Divination by Eilfie Music, and Intro to Cryptzoology by Chris Edwards. Overall the lectures were very informative and I took many notes during these lectures. 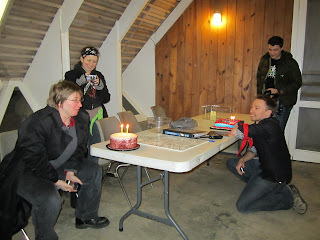 While at camp we also celebrated Sergey and Chris's birthday early since both of their birthdays were at the end of March. We had two birthday cakes, sang happy birthday and then we watched X-Files. It was a lot of fun, and the cake was really good. On the last day of camp it was definitely bittersweet and emotional for some of us as so many of us had become very close and gotten to know each other very well. We all said our goodbyes, gave each other hugs, took pictures and reassured each other that we would all be back together again at another future event. The next morning we all got up, packed up our suitcases and headed out of the camp grounds. I took one look back and thought to myself, I hope they do more future events here as the location was just absolutely breath taking and I loved every minute of camp, the trails, activities etc. It was so perfect and comfortable. I could have stayed another week. Once I got home I was so glad to hear that PRS had already planned another Camp Paranormal for June. I didn't hesitate and I bought a ticket right away. I can't wait to go back, reunite and meet new friends, go more in depth with the paranormal lectures, ask more questions, go on more investigations, hopefully challenge myself even further, enjoy more camp meals together, and get to learn more about myself. Not only was it about learning about the paranormal, it was also about rediscovering yourself and being challenged by others as well as challenging yourself in ways that may be uncomfortable but at the end of the day accomplishing something bigger and better than you ever thought you could do. I think many of us also accomplished the challenge of having to be out in the cold everyday, and heating up by the fire when we could. I wouldn't change anything about this experience. I had an awesome time and I can't wait to go back in June. I also can't wait for warmer weather. I hope to see you at Camp Paranormal 2 in June. Don't worry if you come alone. I have been to many events on my own. Gettysburg Field Trip 13 was my first PRS event on my own and since then I have been to many events and I always made friends within seconds/minutes so I can guarantee that if you do come to camp that it will be the same for you. We truly are a unique, fun-loving, interesting group of people who like to welcome new and old friends to come along with us on the journey and to seek the unknowns of the paranormal.